Delmar Learning's new TechOne: Manual Transmissions simplifies teaching and learning with its unique format. 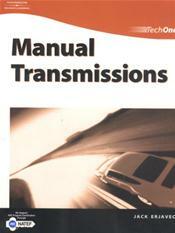 Concise chapters cover theory, diagnosis, service, and repair for manual transmission systems, sub-topics, and components. This easy-to-follow method helps students rapidly progress from one topic to the next. Strong illustrations and photos enhance the approach for visual learners, and all students can benefit from the coverage of ASE certification requirements. Once the course is completed, an ASE practice exam in the Appendix allows students to put their skills to the test.